Hyper Online Casino Review – Enjoy a Huge Welcome Bonus of $/€ 300! Hyper Casino is a dynamic new gambling platform that only went online during late 2018, but don’t let its youthfulness deceive you into believing they are novices to the industry! In fact, the people behind Hyper Casino have been in the casino world for decades and really do understand how to create a sensational gaming experience. In our review we will cover every aspect of the inns and outs of the workings of Hyper online casino, but let’s start with the exciting news! Because they understand that the thrill of online gaming is something special, Hyper casino have put together a massive sign-up bonus of $/€300! We think that a bonus like this is hard to find and is definatively not something to be ignored! Hyper Casino has been developed by some of the world’s best gaming developers, like NetEnt and Microgaming, and with its 700 gaming options, it offers mass apeal to both newbies and seasoned gamblers. Open 365 days a year with a massive range of games, and enhanced by its HD quality, this casino offers a very friendly and knowledgeable customer service team, great security, a wide variety of payment methods and games, games, and more games! Besides the welcome deposit, Hyper will be offering regular bonuses and free spins in line with the casino activities, and the more you play, the more you stand to win. But since Hyper is still so new, they don’t have many promotions presently, but the rumour is that they soon will have plenty! Their main promotion right now is for the slot of the Week which offers 50 free spins to use on the Book of Aztec slot game. You can instantly qualify for 50 free spins when you deposit $/€50 and use the code WINBIG. The Slot of the Week is only valid for 7 days after its been claimed and will expire if not used in that time period. There is a wagering of 45x which means that all winnings from the free spins must be wagered 45 times before being allowed to withdraw. In simple terminology, a wagering requirement is the amount of times you must play a bonus before being allowed to convert it to cash for withdrawel. For example, If your online casino offers you a $/€10 bonus with a 20x wagering requirement, you will have to wager $/€200 before you can withdraw your winnings from bonus mney and free spins. Your accumulated winnings made during gameplay contribute towards your wagering requirements and they will be held in a pending balance until the requirements are met. At Hyper Casino, your welcome bonus must be wagered 45x and the welcome bonus is triggered when $/€10 or more is deposited. Free spins are valid for 7 days and bonuses for 30 days. An availaility of a large selection of payment methods is often seen as a sign of a casinos attention to player satisfaction. This is because players want to use a payment method that is convenient, charges a low fee and executes the transactions swiftly. 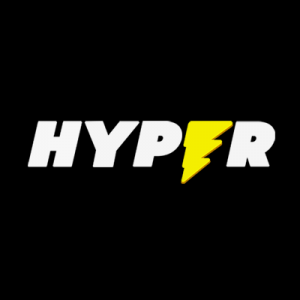 Hyper Casino excels in this regard, they support more than a dozen payment methods, including the major credit cards Visa and Mastercard, e-wallets, Skrill and Neteller and other payment methods like Zimpler, Trustly, Ecopayz, Klarna, Paysafecard, Sofort, Interac and Boku. The casino doesn’t charge players any fees when making payments or withdrawing funds. The minimum deposit amount is $/€10 and the maximum withdrawel per day is $/€5,000. The casino features cutting-edge security technology and the highest level of encryption protects all your activities on the site from unauthorised access by malicious third parties. Register an account with this secure and safe platform, Hyper Casino, and you’ll get hours of quality casino gaming! When it comes time to withdraw your winnings, the support team will ensure a fast withdrawel. On Mondays to Fridays, any request made before 06:00 will be processed on the same day, and after 06:00, will be processed the very next day. Hyper casino places a strong focus on the variety of their online casino games. There are the standard video slots that have aways been very popular with gamers, as well as the more traditional games like Poker, Baccarat, Blackjack and Roulette. There’s also a live casino, offering an authentic gaming experience. Players can enjoy video slots, Progressive Jackpot games, table games, video poker and a live casino. An intriguing addition to the casino are the lotto games, not commonly found in most online casinos. Hyper casino is partnered with some of the most reputable and famous game developers in the industry. NetEnt, Evolution Gaming, Microgaming, High 5 Games, Blueprint Gaming., Novomatic, Thunderkick, NYX Gamign Group, WMS, Big Time Gaming, Scientific Gaming and Elk Studios work in perfect synchronicity to create a space filled with a huge variety of the very best casino games possible. Register as a new memeber and enjoy slot games such as All Ways Fruits, Bells on Fire and Fruit Fiesta 3 Reel and video slots like Dead or Alive, Immortal Romance and Jungle Spirit. If you want to try for the millions, give the jackpot games a spin, some of the best include Major Millions, Mega Moolah and Mega Joker. If you’re more of a Poker player, you can enjoy titles like Tens or Better, Bonus Deuces Wild and All Aces Poker, and if you tend towards table games, here you can enjoy Pontoon Pro, Blackjack Double Exposure and Red Dog. For something different and a nice break from the standard casino games, try Electro Bingo, Four by Four and Hexaline. If you’re not quite ready to make a real oney deposit, why not consider playing all the games, except the live casino, in demo mode so you can get a feel for the way they work before investing your cash. For a very realistc and immersive gaming experience, the Live Casino is the place to be! Interact with the dealer and find out why this way of playing classic casino favourites is becoming more and more popular every day. To play the live casino games, you must be registered as a new player and signed in. There are 70 games to choose from inclluding Roulette, Poker, Baccarat and a very large variety of Blackjack. You can play real money and demo games at Hyper casino from your mobile phone or tablet. The most popular way to play online caisno games these days is on a mobile phone or tablet as if affords so much freedom and convenience. Stuck in traffic? On a long commute? There’s nothing more satisfying than passing time playing some casino favourites. Hyper casino is still very new and as yet doesn’t have a dedicated app for operating systems like iOS, Android, Windows Mobile, or Blackberry. The lobby for the mobile casino is on the home page of the site, and every game can be played for fun and for real money, simply log into your account. The sleek design looks incredible on smartphones and tablets, and it’s a very easy site to navigate. Owned and operated by L&L Europe LTD, Hyper Casino was launched in late 2018 as a portal for casino games primarily for players from the UK, Sweden, Norway, and Finland, but it also accepts players from almost everywhere around the globe. Before signing up at any online casino, a person should make sure that the casino has legitamate licences from an online gambling regulator. Hyper Casino is legitimate and has dual gambling licenses, one from the UK Gambling Commission for UK players, and another from the Malta Gaming Authority for players from other countries. The casino displays its licensing information and its licensing numbers at the bottom of its website. You can trust that Hyper Casino offers fair, fun, and a very entertaing casino platform. Hyper Casino offers a great selection of high quality online casino games, with excellent graphics, and a very lucrative bonus which will keep you coming back for more. There are not enough promotions as yet, but this will change as the casino grows. They are dedicated to ensured excellent customer service and efficiency and as a regulated, safe and secure casino, with more than enough deposit and withdrawel methods, we recommend it. There are over 700 casino games to play on your desktop, mobile or tablet, and this makes for an exciting and intereting casino experince, appealing to every taste.